Gerry was going good and by the time I reached the left turn into the forest, he was out of sight. It was going to be a long slouch for me, watching my average watts dropping already below my total-ascent average from my previous two timed ascents and just starting the forest… Luckily about 45min into the climb I started feeling better and just kept going at threshold heart rate. (So, Gerry, now we know the answer to your question: when not in great shape, I lock on heart rate, as the “normal” power numbers are not reachable.). This third timed ascent probably was my toughest through the forest–and that may be more mental (realizing that I was going to take a hit; the only question was how much). Once past the chalet, with the 1911m summit in sight, I was hoping for damage control and keeping my time under 100min … and I almost did. Gerry had a great ride, close to his personal best. For me, today confirmed my suspicion that my form isn’t there this year (of course, I could continue with excuses): in 2010 I climbed solo in 96min, in 2012 in 92min but this year 101min… That’s almost 10%! I guess I shouldn’t be surprised given my lower power numbers on tests and intervals this year (the times indeed perfectly correlate as science says they should), but you know how that feels. Moral of the story: perhaps there’s something to real training (which I only started doing two weeks ago with hard intervals compared to previous years…). There is no free lunch on Ventoux. I need to get serious again… Or do I? We had a fun descent (well, with one little detail to be omitted) and closed off a great day with Gerry with a well-deserved beer and lunch. Why did I not take more pictures? Next time! Thanks for the day out, Jan. Although you didn’t have your best time up Ventoux, what you didn’t tell your readers is that you passed everyone on the mountain except one single skinny dude! All things are relative 😉 Looking forward to riding with you again…but next time can you suggest a ‘leisurely ride’ – my legs are killing me! True, Gerry. And the legs fit the blog’s title… It’s the good feeling after a max effort! Regarding beating 90min: you can extrapolate your avg watts which will give you a target. (Reaching that is another matter as it takes so much work to raise threshold power…) hopefully someday we get there! 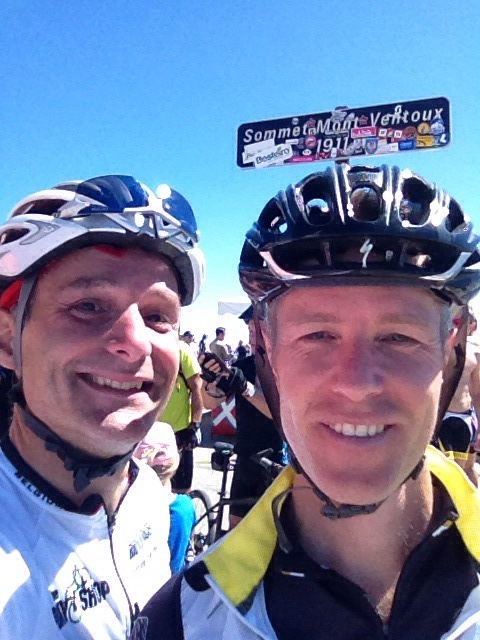 Great post Jan. As I said on Gerry’s blog, there’s no such thing as a bad ride up Ventoux….just some are better than others. Ventoux is a special mountain to climb and each time up is unique and well remembered. I wish I could have joined you both, just to feel the pain that’s associated with the satisfaction of putting out a maximum effort. Rob: hopefully we get to climb this one all three together sometime… Your best time definitely is an inspiration. True there is no bad ride: The good learning is that this now quantifies to me the impact of training, which also is an inspiration. Yes: Canadian living in France now. We met on Haute Route last year. And as I said on Gerry’s post, fabulous ride, congrats! Didn’t realize you are living in France. Good on that alsk!